Australia have been dealt a blow with Mitchell Starc ruled out of the upcoming limited-overs series against India due to a torn pectoral muscle. Starc took 10 wickets to lead Australia to a resounding win over Sri Lanka in the second Test in Canberra, but was hurt on the final day. The left-arm paceman was left out of the 15-man squad for the tour of India starting on February 24. 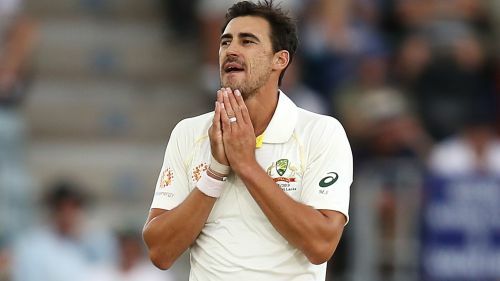 "Unfortunately, scans have revealed that Mitchell Starc sustained a substantial tear to his left pec muscle while bowling on the final day of the Test match in Canberra," Australia national selector Trevor Hohns said in a statement on Thursday. Australia will play two Twenty20s and five ODIs against India, who won last month's 50-over series between the teams 2-1. Starc's fellow paceman Josh Hazlewood is still sidelined with a back injury, with Kane Richardson and Nathan Coulter-Nile to get their chances. Shaun Marsh was included and is expected to be available for the third ODI as the left-hander recovers from a hamstring strain and awaits the birth of his second child, with D'Arcy Short in the squad as cover. Ashton Turner, who has played three T20s for Australia, was also named. "I'd also like to congratulate Ashton Turner on his selection in the squad. Ashton has been on our radar for some time, given his performances in the shorter formats," Hohns said. "Ashton is a smart cricketer who reads the game well and provides us with another strong batting option. Australia: Aaron Finch (c), Jason Behrendorff, Alex Carey, Nathan Coulter-Nile, Pat Cummins, Peter Handscomb, Usman Khawaja, Nathan Lyon, Shaun Marsh, Glenn Maxwell, Jhye Richardson, Kane Richardson, D'Arcy Short (cover for Shaun Marsh), Marcus Stoinis, Ashton Turner, Adam Zampa.